The Kansas City Google Fiber project may benefit from a device & method described in a patent, according to fierce cable. 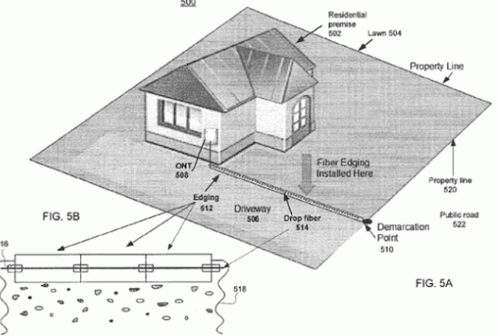 The “device” referred to in the patent (filed in June of 2010), is an edging component which reduces disruption to a subscriber’s yard by eliminating the need to dig. The edging technology keeps consumers happy by allowing lawns to remain intact, and it saves Google a significant amount of time and cost. Further, a faster deployment of Fiber To The Home (FTTH) is to the benefit of Kansas City, as the economic growth and impact can materialize much sooner. The edging device may have decorative color or pattern on the outside surface for aesthetic purposes. Alternatively, the edging device may be coated with selected colors to blend with the environment, e.g., a garden or a lawn. In other embodiments, coatings may be made attachable and removable from the edging device and different styles of coatings may be separately available to the customers. Additional excitement in the KC technology community occurred this week, when Eric Schmidt (Executive Chairman at Google) mentioned the project in Kansas City and what the ramifications might be as a result. What are your thoughts on this and some of the other KC Google Fiber news stories from the week? BBC Asks: Can Google Fiber Change Kansas City?